Animate gifs in your Teachers Pay Teachers store to dress it up! 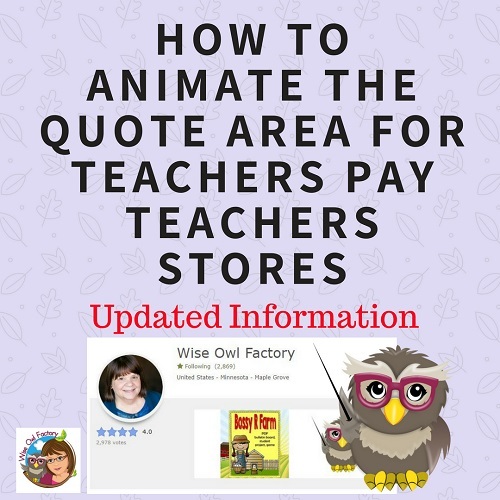 This post is about how to animate gifs in the quote Area for TpT (Teachers Pay Teachers online education store). Have you noticed animated gifs in the quote are on TpT stores? 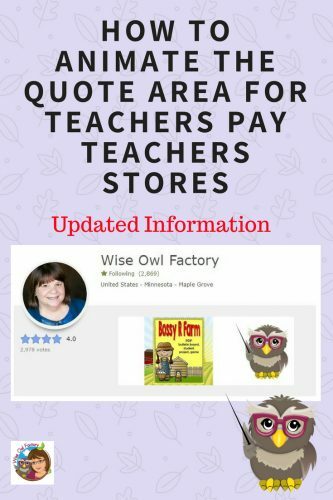 This post has information about making an animated set of pictures that rotate for the quote area on Teachers Pay Teachers stores. Would you like a gif like that? This is an informational post, and the same information is available as a free product also on Teachers Pay Teachers. First, here is a YouTube video showing how to make the gif. After watching the video, please see this PDF with instructions to refer to as you create your animated gif. The PDF has links and step by step information for you to make your quote area pop. 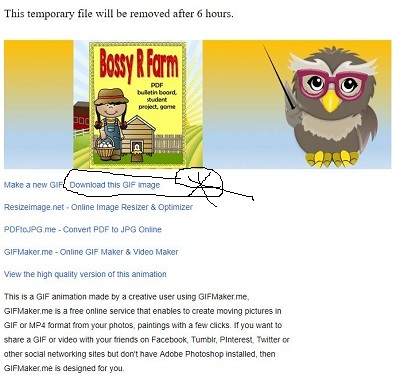 It is free to create animated gifs at the site listed in the printable. This is a link which will open a free blank PowerPoint all set up ready for your own pictures. The slides are correctly sized already. Of course, the slides will be blank until you add product covers and words. The gifs may be updated from season to season as needed, also. Do save whatever you create for future editing. 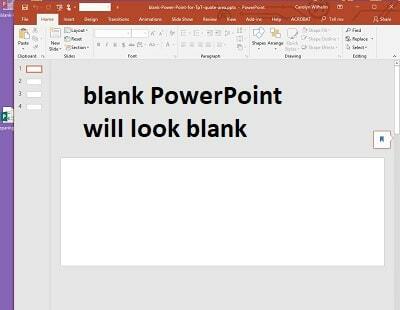 The best blank-power-point-for-tpt-quote-area program to use is PowerPoint, I think. Save the PDF for future reference. These directions are also available as a free download on TpT. On TinyURL.com get a shortened link for your animated gif. 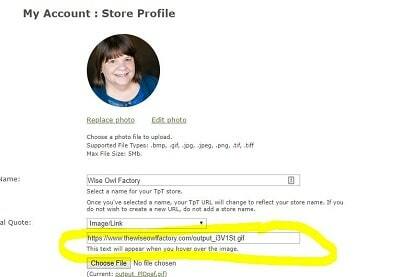 Copy the shortened link for your photo animated gif ready to place in your TpT store edit profile quote area. An online page or ftp program where you store photos (blog, WordPress, Photoshop—-wherever you can obtain a URL for the photo gif). Your link from gifmaker.me will look like the following. You may need to add the .gif depending on how it uploads to your online storage photo area. 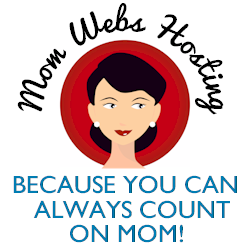 You only need Tinyurl if your photo URL address is long. You may not need to shorten your photo URL depending on where your store photos. 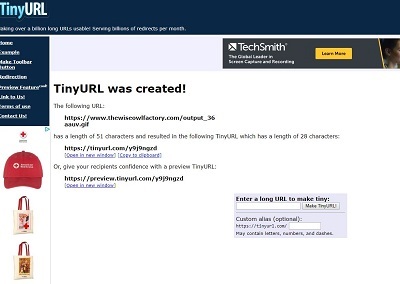 Why TinyURL? Because the quote area space in TpT is limited. If the links are not shortened, it will not work. These instructions require some familiarity with blogging, Teachers Pay Teachers, online photo storage, and how to find the edit profile area of your store. These instructions only apply to TpT and are not intended for other online stores. 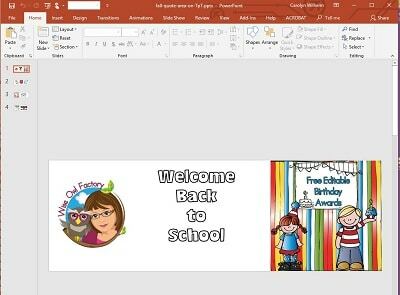 Add your images to the PowerPoint as you wish, to promote your own store. I make one for fall, winter, spring, and summer. Save as PNGs. Upload the images to gifmaker.me. Change the speed of the slideshow gif to what you want. I have to look at it more than anyone else so I make it a little slower than their default setting. Save as gif animation. 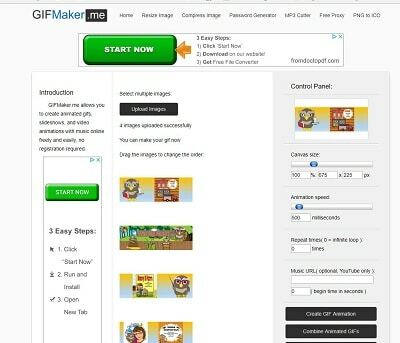 Create gif animation, then view and download. The gif will need to be stored online so it has a URL. This might be anywhere you already store photos, and you can right click to get the URL. I add mine through my FTP program. Check whatever address you have for your gif to be sure the gif is uploaded correctly. Add this link to your TpT store. You might need to run it through Tinyurl.com to shorten the link length. After saving, Teachers pay Teachers will have changed your link to some HTML(after a while) and that is fine. We used to have to do that ourselves but now we do not have to know HTML for this part of the process.